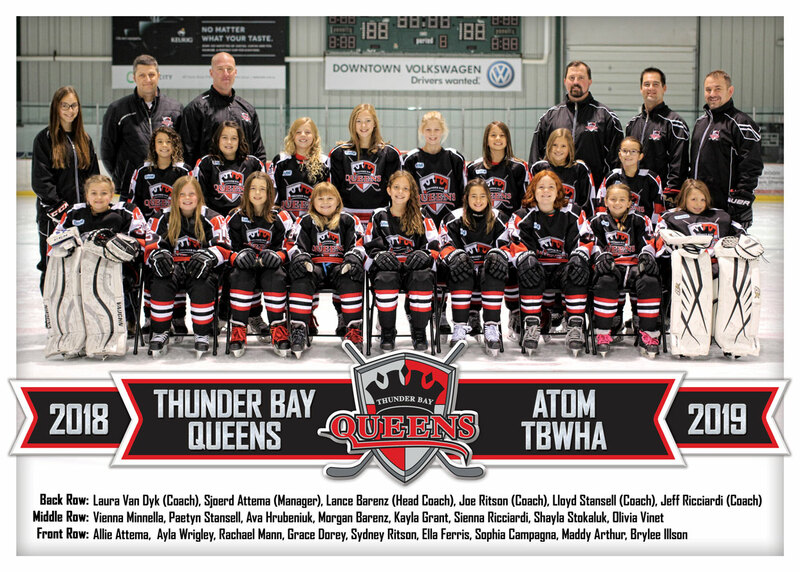 THUNDER BAY, ON — After going undefeated through five games, the Gridlink Atom Queens fell in the Semi-Finals of the Elks Tom Thumb Atom Tournament to the Neebing Hawks by a score of 1-0 after the Hawks scored the only goal of the contest with 2:20 remaining in the game. It was an excellent showing for the Queens though as they outscored opponents 23-6 on their 5-1-0 run. The final rounds of the one-game playoffs were air-tight as the Neebing Thunderhawks also beat their Semi-Final opponent 1-0 but would end up losing to the Hawks 6-5 in the Championship game. THUNDER BAY, ON — After a couple lopsided wins, the Gridlink Atom were in for much tougher competition on Saturday. In their third and final round-robin game, the Queens met up with the North End AtoMc Flames. After a scoreless first, the Queens erupted with three goals in under four minutes in the second with Olivia Vinet, Ayla Wrigley and Maddy Arthur all getting on the board. North End came back in the third with a couple goals of their own but goalie Brylee Illson would hold the one-goal lead for her team. 3-2 win. The Queens’ 3-0-0 record gave them a Quarter-Final matchup against the VP Bearcats. Maddy Arthur opened the scoring on a play from Ava Hrubeniuk but VP had an answer just a couple minutes later. Tied in the second, the Queens would take the lead as Arthur banged home her second of the game off a setup by Sidney Ritson. The Bearcats tied the game early in the third. With the a berth in the Semi-Finals on the line, this game looked like it could go into overtime but Olivia Vinet would get her chance and make no mistake, scoring and putting the Queens up 3-2. Allie Attema would need to be flawless in VP’s late push and she was, as the Gridlink Queens took this game, as they did their previous one, 3-2. The Queens’ quest for gold will continue on Sunday at 9:00am as they take on the Neebing Hawks in the Semis. THUNDER BAY, ON — The Gridlink Atom Queens are participating in the Elks Tom Thumb Atom Tournament and jumped on the Atikokan Voyageurs in their introductory game. Grace Dorey opened scoring after a setup from Morgan Barenz. Shortly after, Maddy Arthur would get the puck to Sydney Ritson who’d score to give the Queens a 2-0 lead. Before the first period could end, however, Olivia Vinet would score with 7 seconds left, assisted by Ella Ferris. Early in the second, Siena Ricciardi drew an assist, setting up Shayla Stokaluk for the only goal of the period. 4-0 after two. In the third, Arthur to Ritson showed up on the scoresheet again. Ayla Wrigley potted a goal from Ava Hrubeniuk and Barenz would knock in the 7th and final goal as the Queens coasted to a 7-0 victory. The Atom Queens continued that afternoon, taking on the Mallons Elks who’d get on the board late in the first but wouldn’t escape the period with the lead as the Hrubeniuk and Ritson both scored 24 seconds apart. In the second, the Queens opened the game up with Sophia Campagna, Barenz and Arthur all putting up markers under the goal column to give their team a 5-1 lead. The wheels really fell off in the third for the Elks as the Queens notched 5 goals. Hrubeniuk, Campagna, Arthur and Barenz would all get their 2nd goals of the game and Wrigley also potted one for her team. 10-1 final. Saturday, the Queens will face North End at 8:00am after which time, their record will to taken into account for Quarter-Finals matchups later that day. Semi-Finals and Championship games will take place on Sunday.